With the fourth-annual REVOLT Music Conference in full swing, it's already proving difficult for those in attendance not to catch a burst of inspiration in each and every room they step into. 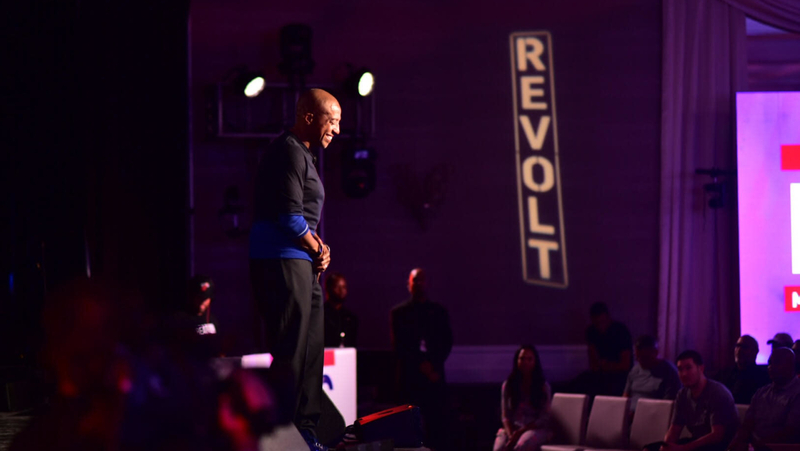 Kevin Liles, the current CEO of 300 Entertainment and storied music executive with a resume 300 pages long, was tapped as an official keynote speaker, using his time on stage to share a powerful presentation drawing from his personal insight and expertise to showcase how music truly is power. Drawing from his wealth of experiences, Liles turned to some of hip-hop's most coveted, foundation-building records, with each throwback audio clip further illustrating his point that not only has hip-hop culture come a long way since its landmark birth four decades ago, but the power it holds is as timeless as it is transformative. "This is the power of music," Liles began. "I think some of y'all forget why it was created. It's because music is the soundtrack to our everyday life. When I heard this song, I lost my mind." Right on cue, LL Cool J's "Rock the Bells" began playing. "Back in the 80s, it was like, when you'd hear that record, how could you even sit down?" Liles mused. "People didn't even know who we were, what we were. It was all so real to me. But the real fight that we had was that people thought we were a fad. People thought that we had to fight for everything. Remember when the radio stations used to play us only on Fridays from 8-9pm?" As the former Def Jam president took the audience back to the early days of the culture, he turned to Eric B and Rakim's "Paid in Full," N.W.A. 's "F—k the Police," and Public Enemy's "Fight the Power," illustrating the obstacles of adversity and opposition that hip-hop culture and people of color have been facing for a long time, drawing a parallel to how today, "We still say, f—k the police and still fight the power today." After playing snippets of Snoop and Dr. Dre's "Nuthin' But a 'G' Thang," Biggie Smalls' "Juicy," Kanye West's "Jesus Walks," Tupac's "Keep Your Head Up," and Eminem's "Real Slim Shady"—and explaining why each record was both influential to him personally and to the culture at large—Liles pointed out how each one of these songs reflects the authentic truth of the people behind each song, with the truth being where the power lies and why each artist was able to carve their own respective legacy. "I knew in my life, that anything was possible because what I looked like and the color of my skin did not define where I was going," Liles stated. "I had to keep my head up, in order to be authentic, to be creative and to tell our stories, and more importantly, our truth. … I don't care about the color of your skin, I care about you telling your truth." "Every one of these songs put a smile on your face, or a tear to your eye," he continued. "To get you motivated, to get you started on your next move. To get your hustle going. These truths… that's the power of music, that's the power of hip-hop. That's the power of our culture. That's where we are today. What is in these songs, this is all a soundtrack to our lives." As Liles stressed, where we decide to take the culture next reflects directly with making the decision to be rich in life and rich in spirit, with what we've learned in the past allowing us to progress forward together.